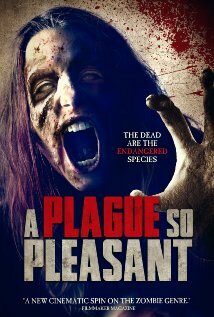 'A PLAGUE SO PLEASANT' sees the world infected by zombies but instead of the usual man against the undead struggles as seen in countless zombie films, this film has the undead be a protected endangered species free to wander amongst the living. Though not all feel this is fair and that once you are dead you should stay dead, for the loved ones it is a continuous struggle to see their departed walking again. Will they be willing to break the laws that protect the undead to see family and friends rest in peace? Director Benjamin Roberds has made this zombie feature on a small budget but you will be hard to tell as some of the decayed zombies in the film look like they have had a good amount of money spent on them. Sure not 'WALKING DEAD' type special effects but good still. The lead charcter struggles within himself to have his sister visiting her dead boyfreind in a zombie nature reserve with the comical sign on the fence saying 'Warning. Pick pocketing the undead is considered grave robbing and will be prosecuted'. His feelings for this are pushed over the edge by his friend wanting to date his sister and thus he goes and kills the zombie boyfriend, unfortunately this sets the zombies off on a rampage. The clever use of using black and white for the calm before the storm and the ending is great as is using colour to show off the impending zombie rampage. Sadly some scenes are long and drawn out but a good film overall.